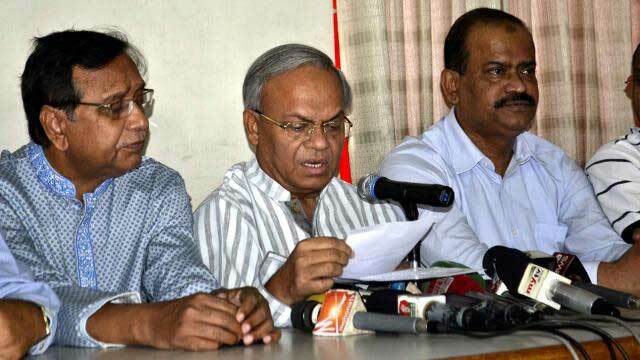 Dhaka, Apr 12 (Just News): Prime Minister Sheikh Hasina's announcement to abolish quota system in the public service is contradictory to the country's constitution, BNP said today. "There are some intriguing puzzles in the announcement. The prime minister frustrated the entire nation by announcing to abolish the quota system," BNP Senior Joint Secretary General Rizvi Ahmed said while addressing a press conference at the party's Nayapaltan central office in Dhaka. Claiming that an “evil plan to daunt the quota reform activists is being hatched by the ruling quarter”, Rizvi said the prime minister in her announcement has expressed her anger, annoyance and threat indeed. Prime Minister Sheikh Hasina, in the parliament yesterday, made an announcement to abolish the quota system in the face of persistent large-scale of protests waged by university students and job-seekers across the country against the government’s reservation of quota in public services. "The prime minister's order will be rejected if anyone files a writ petition against it as it’s clearly stated in our constitution about reservation of quotas for the families of freedom fighters and disadvantaged people in public jobs," Rizvi said. The prime minister has abolished the quota system though the students and job seekers were engaged in waging movement demanding its reformation, Rizvi said. "It means, the government didn’t put its heed to the demand sincerely," the BNP leader said.